Travers Stakes 2017: Could Tapwrit Win The Mid-Summer Derby? For Brian Spearman, co-owner of the Belmont winner, it would be a dream come true. 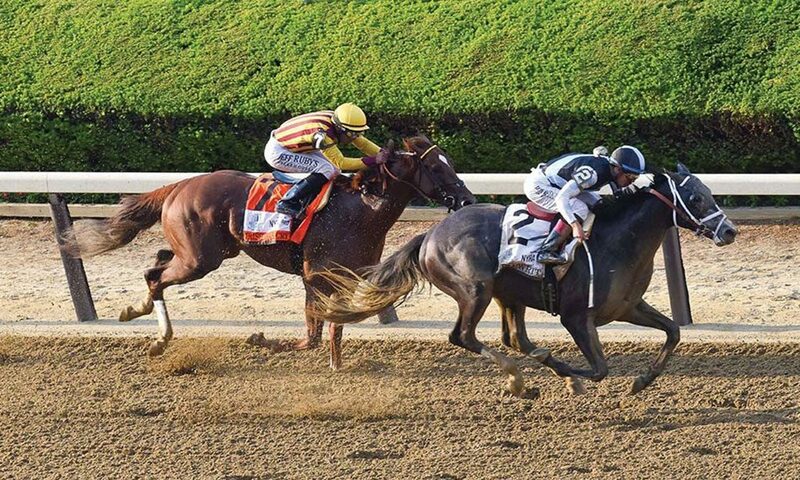 a year after losing the Belmont Stakes by a nose – included liberal doses of happiness and relief. Spearman, who spent much of his youth in Saratoga Springs, where Thoroughbred racing is part of the culture, quickly discovered that a victory in an American classic, the oldest Triple Crown race, can be an exhilarating and numbing experience. In the 2016 Belmont Stakes, Spearman was part of the ownership group with Destin, who was edged at the wire by Creator. Like so many people raised in the region surrounding Saratoga Race Course, Spearman, 55, learned to love the sport at the old track on Union Avenue, where he later had a summer job, working overnight in security. Following a very successful corporate career at PepsiCo, he is a principal in Eclipse Thoroughbred Partners, one of the co-owners of Tapwrit. Fully appreciative of the significance of winning the Belmont Stakes, Spearman would love to see Tapwrit become the 30th horse to win the Belmont and Saratoga’s signature race, the Travers Stakes. With a hearty devil-may-care laugh, Spearman acknowledged that while Eclipse Thoroughbreds Partners co-owner and President Aron Wellman cautions him not to look too far ahead, the thrill of winning the Travers is something he hopes to experience this summer. Last year, Destin finished ninth, which was far, far, far behind record-setting Arrogate. As a longtime fan of racing and an owner for six years, Spearman knows that it is foolhardy to try to predict whether powerful but fragile Thoroughbreds will be sound and ready for a race two or three months away. Still, why be in the game if no wishing and hoping is permitted? The Travers will be run on Aug. 26 and, as usual, Spearman will be there. Spearman’s family moved upstate to Saratoga Springs in 1970 when he was 7 years old because his father was working on the construction of the new campus at the University at Albany. He attended St. Peter’s schools and graduated from Saratoga Central Catholic High School in 1980. One month after earning a degree in economics from Fordham University in 1984, he started what turned into a 32-year career with PepsiCo that took him and his family to assignments around the United States and included international responsibilities. His final role was as a senior vice president of the supply chain. With his 50th birthday approaching, Spearman decided to become more actively involved in racing. He describes it as a straightforward move: “I said, ‘I’m at a point in my life, I’m blessed and maybe I could fulfill part of a childhood dream to own a piece of a racehorse and see what that’s all about. '” His research led him to Dogwood Stable, the original partnership company formed nearly 50 years ago by the pioneering Cot Campbell. Early in his time with Dogwood, Spearman asked Cot Campbell to meet him for breakfast to discuss a very personal request: allow him to purchase all the shares in a Dogwood horse that he would name after his late son Nolan, who had died suddenly at the age of 2½, nearly 20 years earlier, on Christmas morning. Though it completely went against the concept of a partnership, Campbell agreed. Spearman had waited until his two children, Laura and Aidan, were teens, old enough to be involved in the tribute to their older brother. They made a visit to Aiken, South Carolina, and picked out a yearling sired by Malibu Moon that Dogwood had purchased. Laura came up with the name: None Like Nolan. On July 31, 2014, in his fifth career start, None Like Nolan, picked up the first of his two career victories by a nose at – where else? – Saratoga Race Course. Although he and his six siblings all moved away from Saratoga Springs, Spearman stayed connected to the city by visiting his mother, Joan, who died in March 2016. He is a full-time resident of Ridgefield, Connecticut, but owns a home in Saratoga Springs and stays in touch with classmates at Saratoga Central Catholic. Spearman’s work with Eclipse brings him back to Saratoga for the entire racing meet, and he visits every month now that he is the chairman of the board of the Saratoga WarHorse Foundation, the nonprofit that serves veterans. Saratoga WarHorse will hold its Blue Spangled Evening Gala on Aug. 14. Through the merger of Dogwood Stable and Eclipse Thoroughbred Partners, Spearman transitioned into investing in Eclipse horses. In 2015, he purchased the equity of the Eclipse co-founder, who was leaving the company, and became Wellman’s partner, with the title of chairman. At the end of the first quarter of 2016, Spearman retired from PepsiCo. He is now completely involved in racing. In the week after Tapwrit won the Belmont Stakes, Eclipse had approximately 60 horses in training and 300 active investors. Wellman, who is based in Southern California, grew up in a family that owned racehorses, and formed his first partnership when he was a young lawyer. In 2008, he became a vice president of Team Valor International and went on to start Eclipse Thoroughbred Partners. Spearman focuses on the business aspects of the company. In August 2015, at the Fasig-Tipton Saratoga sale, Wellman and Spearman took a major gamble and purchased a yearling gray son of top sire Tapit. Certain that the bidding would go well beyond Eclipse’s budget, they formed a partnership with Robert LaPenta and Bridlewood Farm, owned by John and Leslie Malone. The group prevailed and landed the colt for $1.2 million. They named him Tapwrit – Tap from the sire’s name, and writ, which is a legal document, because the dam’s sire is named Successful Appeal. He finished last of 10 in his first career start at Saratoga but won his next two starts. He lived up to expectations in the Belmont Stakes, running down Irish War Cry in the stretch following two disappointing finishes, fifth in the Blue Grass Stakes and sixth in the Kentucky Derby.